Courtesy of Amy Povah and Clemency for All Nonviolent Drug Offenders (CAN-DO).Alice Marie Johnson is serving a life sentence in prison for first-time, nonviolent drug offenses. 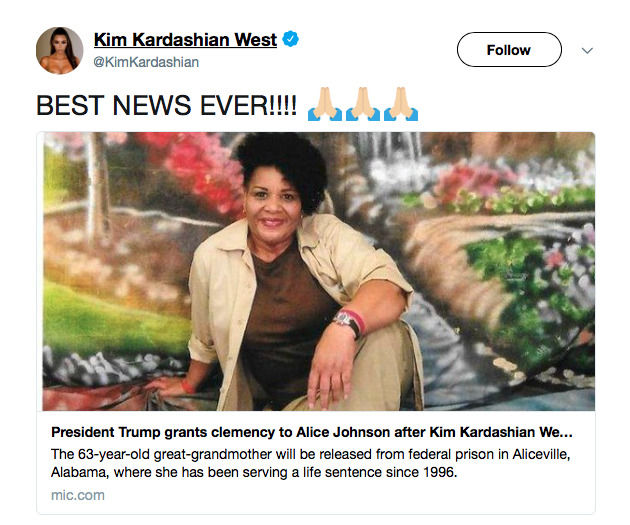 Trump granted the clemency one week after meeting with Kim Kardashian West, who has publicly championed Johnson’s case. President Donald Trump commuted Johnson’s sentence on Wednesday, the White House said in a statement. The move came one week after Trump met with the reality-TV star Kim Kardashian West, who has for months been championing Johnson’s release. Kardashian West and her attorney Shawn Holley won a highly sought-after meeting with Trump after weeks of negotiations with Trump’s son-in-law and adviser, Jared Kushner, Business Insider previously reported. The talks came shortly after Kardashian West’s husband, the rapper Kanye West, made waves in the media for declaring his fervent support for Trump. Johnson’s daughter Catina Scales told Business Insider she was en route to pick up her mother from the Aliceville correctional facility in Alabama, where Johnson is expected to be released on Wednesday. Johnson told Business Insider on Tuesday that she had been waiting with bated breath for news about her case since Trump and Kardashian West’s meeting. Johnson, who has corresponded with Business Insider regularly in recent months about the developments in her case, said Kardashian West’s involvement was nothing short of miraculous. In a follow-up tweet on Wednesday, Kardashian West thanked Trump and Kushner for their efforts on Johnson’s case. Another of Johnson’s daughters, Tretessa Johnson, told Business Insider that her family would never forget Trump’s mercy. 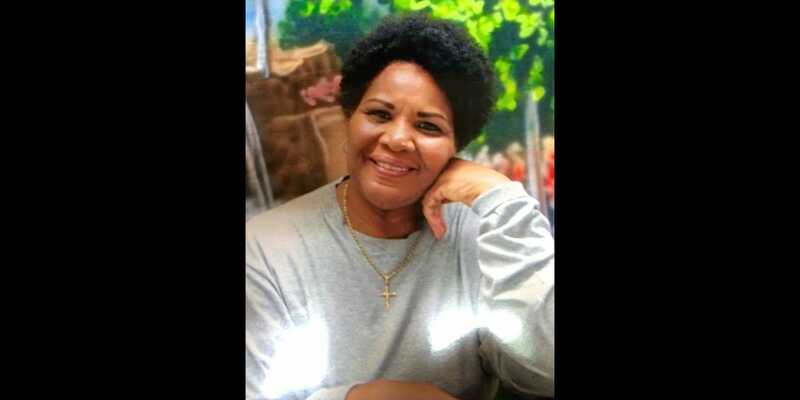 Alice has said she wants to advocate sentencing reform upon her release, Tretessa said, because there are thousands of other people serving similarly lengthy sentences for first-time, nonviolent drug offenses – and they shouldn’t be forgotten. Johnson’s case has long been held up as an overwhelmingly worthy candidate for clemency by legal experts, lawyers, prison staff members, and advocates of criminal-justice reform. She has been described not only as an extreme example of the type of harsh mandatory-minimum sentencing that emerged in the 1980s and ’90s to punish drug crimes, but as the embodiment of a reformed and repentant prisoner with the skills and support to successfully reenter society. Johnson is an ordained minister, a playwright, a mentor, a counselor, a tutor, and a companion for inmates who are suicidal, and she didn’t commit a single disciplinary infraction in two decades in prison, staff members at Aliceville who have supported her clemency said in 2016 in several letters viewed by Business Insider. Kardashian West first took an interest in Johnson’s case last October, when she saw a viral video published by Mic in which Johnson gave an interview via Skype. Kardashian West shared the video with her 60 million Twitter followers and retained Holley to work on Johnson’s case. Holley added that Kardashian West was intricately involved throughout the efforts to secure Johnson’s freedom and would often discuss strategy with Holley several times a day. Johnson’s clemency is a striking move for Trump, who had until Wednesday granted just five pardons and one commutation in the first year and a half of his presidency. All seven of Trump’s clemencies so far have been granted to defendants whose cases have drummed up significant support from conservatives or celebrities. While pardons essentially forgive people who have been convicted of crimes and restore some of their rights, a commutation reduces prisoners’ sentences, usually freeing them immediately. Last week, the president unexpectedly pardoned Dinesh D’Souza, the far-right political pundit and vehement Trump supporter who pleaded guilty in 2014 to campaign-finance violations. Trump also made waves by telling reporters he was considering pardoning Martha Stewart and commuting the sentence of Rod Blagojevich, the former Illinois governor. Jeffrey Crouch, an assistant professor at American University who studies presidential clemencies, said it was too early to discern a rhyme or reason to the pardons and commutations Trump has granted. But he added he was struck by how few “average Americans” Trump had pardoned before Alice Johnson, especially given the populist groundswell that lifted Trump to his election victory in 2016. Last August, Trump pardoned Joe Arpaio, the bombastic former sheriff of Maricopa County, Arizona, who vocally supported Trump throughout his 2016 presidential campaign and who often parroted Trump’s hardline stance on immigration. In March, Trump pardoned Kristian Saucier, a former Navy sailor who took photos of classified areas inside a nuclear submarine. Saucier’s case was widely cited among conservative media to compare it with that of Hillary Clinton, who used a private email server while she was secretary of state but wasn’t prosecuted. Trump also pardoned Lewis “Scooter” Libby, the former Bush administration official convicted of perjury and obstruction of justice, and commuted the sentence of Sholom Rubashkin, a former meatpacking-company executive convicted of bank fraud in an illegal labour scheme. Both cases received support from congressional Republicans, and some Democrats also supported Rubashkin’s case. Crouch said that while there were still too few cases to thoroughly analyse Trump’s use of executive clemency, the public may already have deduced a pattern.